This accident was caused by poor tyres. Motorists who drive with illegal tyres could be hit with three penalty points on their licence and a fine of up to £2,500 for each tyre. More Police action checking tyres is what is needed to make drivers aware of the huge problem or poor tyres here in the UK. opinion . Consequently, it is the young Sound Drivers. This is the category of drivers that we do not see buying tyres. Or at least new tyres. There is something happening to make the younger driver want to risk their life. As a result, perhaps they just don’t care about their own safety. Hence, by using Poor tyres and the other road users. We all know the massive cost of insurance policies for young drivers. Subsequently, a young guy who works for me in our tyre department is having to spend £3000 to insure a small Vauxhall Corsa, but young drivers should weight all these things up before they decide to buy a car and take to the road. The other alternative, “which in my opinion is just as bad “is that perhaps they are buying Poor tyres part worn tyres, or their parents are forever bailing them out. I think the later will be the case, but we still don’t see many young men calling into us to buy new tyres, perhaps you know better ? Check your tyres tread for wear as often as possible make it a good habit, and while your at it check out for cuts or bubbles at the same time. Are Snow Tyres More Important than AWD in the Snow? There’s a common misconception that an all-wheel drive car is all one needs to be safe when driving in winter. summer tyres and because they have big wheels and wide tyres, the owners think that they can go any ware in different driving conditions. I remember a few years ago when we had our worse snow for a few years. The phone was red hot with SUV drivers trying to get some winter tyres. As luck would have it we deal with a German tyre company and were able to pick up some stock, but there was certain sizes that were completely unavailable. Things are now getting better with the importing of many snow tyres coming from the Far East. Yokohama from Japan are also an excellent winter tyre and are available in many sizes including tyres for the SUV vehicles. We also recommend General winter tyres but they only make the tyres for the average saloon car. So the moral of this article is to get yourself some snow tyres for your SUV before they start to run after the first snow. Hankook Tyres .Are based in South Korea and was founded in 1941 but then it was known as the Chosun tyre company. The company name that we know today as Hankook tyre was introduced in 1968. The Hankook tyres company now sells its tyre products to many of the Worlds car manufacturers and is catching up with the leading tyre companies because of the quality of its tyre products and the quality of its tyres that are now known Worldwide. Hankook tyres are now the 7th largest tyre company in the World, and are now one of the fastest growing tyre companies. One of the reasons has been the involvement in the field of motorsports, offering its tyre products for many motorsport racing events. Hankook are proud to produce products high-quality and performance vehicles and not just for passenger cars but also for 4×4 vehicles and SUVs as well as for trucks. Some of the car makers that Hankook supply are the massive car manufacturers such as Toyota, Ford and General Motors. This means that when a tyre company supply them for the original equipment cars, then they can look forward to a fair size chunk of the replacement tyre market in a couple of years when the first ones need replacing. This is one of the reasons why Hankook have set up distribution centres in many of the tyre market countries in the World including here in the UK. They have also built new manufacturing plants in China and the USA (Tennessee), they are shortly going to open a new $1 billion tyre manufacturing plant in Indonesia (West Java) to help cope with the huge estimated demand for its tyre products. It is estimated that Hankook will be producing well over 50 million each year along with other auto products that they see such as brake pads, batteries and alloy wheels for the aftermarket. Pellon tyres recently became tyre stockists for recently became tyre stockists for Hankook tyres when they became a member of point-S, a buying group with depots located all across Europe and now in the UK and the USA when they became a member of point-S, a buying group with depots located all across Europe and now in the UK and the USA. “Point-S has enabled us to buy from the leading manufacturers, where before we were too small as a single independent to interest the huge tyre companies, now as part of this group they are” . Pellon Tyre and Auto-centre offer car and van servicing and repairs to all makes of vehicles. We are members of Unipart Car Care centres and give a nationwide guarantee for all our work and parts. We also sell Hankook Tyres online from our website www.pellontyres.co.uk by using the tyre selector and choosing your tyre size. We offer courtesy cars to local motorists who need to go to work and leave their car with us for work doing. We are also an official MOT testing station and are members of Motor-codes, who carry out checks for high standard of equipment and workmanship. Evening Telegraph On damp or wet roads, tyres grip differently — and the braking distance is substantially longer. advising the public about the advantages and safety features of fitting winter tyres to your car. What started me off committing myself to this subject was the massive increase of traffic on our roads, combined with the worsening winters that we were getting. This in my eyes makes road safety, especially where brakes and other road safety factors are concerned. Cars are travelling and accelerating at much faster speeds and therefore requires better braking systems and tyre technology. The latter is probably my specialist subject and a subject that I am passionate about, therefor the advice that I give to drivers and my customers is in their best interest. The subject of whether or not to fit winters in November time or not, to me is a “no brainer”. Here in West Yorkshire winter will shortly arriving , in fact this morning the local council gritting trucks are out gritting the icy roads. Winter tyres have a special compound that has silicone added to the rubber compound. Of course,this ensures that the winters remain flexible in freezing weather conditions, and are still able to maintain there grip on icy or snowy roads. On the other hand a summer ones that do not have additives will begin to harden when the temperature drops below 7 degrees centigrade, when Winter tyres grip . The effect is similar to your wiper blades, we all know that in cold weather that your wiper blades become very hard and will not clean the windscreen, all other rubber items have the same affect, and do not work correctly in cold weather. Eric Roberts members of Tyresafe.org. A HAMPSHIRE tyre business has been fined thousands of pounds for illegally stockpiling 45,000 of waste scrap tyres at an industrial estate. What caused the scrap tyres problem? “All this has stemmed from the fact that waste tyres do not have any value.So,in fact the opposite is the case. Having to pay anything from 50 pence to £1 for Waste Tyre Removal and to be disposed of.Consequently, at one time. When remoulds were very popular. naturally, we would actually sell our old tyres to the remoulding industry. So,also to scrap tyre dealers. Who would come round collecting the old tyres for money. The most popular scrap tyres to sell were the Michelin tyres. Subsequently, in the tyre trade an old tyre is known as a “casing”. Of course, the Michelin casings were the best quality casings that you could get. The same applies today, Michelin are still probably one of the best quality tyres. Hence, that you can buy. Although more expensive than other brands. Michelin tyres are probably still the best on the market. Things started to change. Thus, with the introduction of new cheap tyres mass produced from China.Including, other “far eastern” countries. These cheap imports were flooding the market. Consequently,could be bought for cheaper than a remould tyre. Of course, it did not take long before the remould companies went out of business. Some of the remould companies concentrated on the remould truck market. Continuing in business, but the car re-molders soon closed down due to the lack of sales. disposal. This was followed by new companies setting up to dispose of the Waste Tyres. The most significant new law would not let scrap tyres be used in landfill sites (tips). So solutions had to be thought of quickly. Germany had already started using old scrap tyres to burn in cement kilns to turn the liquid cement into the powder that we use in building things, but here in Britain we were a bit slow, but we are now looking at similar ideas. Most are now shredded and used in all sorts of applications including mixing the shredded rubber with tarmac to be used on road building. All this however did not stop illegal Waste Tyres dumping and we still have the problem today. we have all seen old ones piled up in the country side or on waste land, and guys like the one who rented a large building or just land to fill with scrap tyres and then when they are full they just walk away and leave the problem to the owner of the building. One old mill in the Bradford area of West Yorkshire was filled with over a million scrap tyres and then the culprits just walked away leaving the problem to the environment agency, which in the long run has to be paid by the tax payer”. In the last few days I visited the beautiful city of Chester in Cheshire, North West England. Chester is very close to the Welsh border and is steeped in history. Of course, the city was once a Roman settlement. So, still boasts a near complete Roman wall. Encircling the city centre. Including, its many shops and hotels. Attracting millions of visitors a year. My daughter Brooke collecting her graduation gown from the University campus in Chester. My wife and I were in Chester to see our daughter receive her Honours degree. Naturally, from the University of Chester. The ceremony was held at the cities cathedral. Attended by many dignitaries and important university personnel. Subsequently, the service took some two hours. But was well worth it see our daughter Brooke receive her degree in French studies. Indeed, we were very proud parents indeed Celebrating with a nice meal and a few drinks. Before heading back to the hotel for a few more night caps. The Hotel was the Mill Hotel and Spa complex Hotel just off the centre of Chester and very nice it was too. 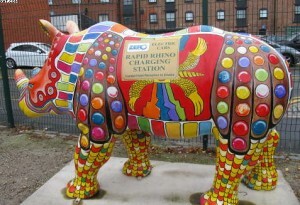 On arriving I could not help noticing that there was a few very large life size replicas of rhinos, painted in very bright psychedelically painted situated around the hotel car park. Looking more closely I noticed that they all had a sign attached to them. 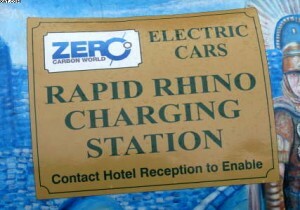 To my amazement the rhinos were in fact “electric car charging points”. ELECTRIC CAR Battery- charging is free to residents of the hotel. These were some of the first that I had ever seen in the North of England. The Hotel had them installed care of a company called”Zerocarbonworld.org” and are fitted free of charge through government grants and special funding. I have always been interested in the electric car and other inventions that are at the moment flooding the car market place, so I could not wait to turn this find into a blog. When we checked out I asked the guy at the reception how much they charged to top the battery up on an electric car and to my surprise he said that there was no charge for the service indeed the service was free. But as a business man I know that the electricity used would have been a business cost and used to calculate the cost of a room, so therefor we would have been paying for the cost of charging up an electric car battery in the price of a room. The reception guy then told me that they had only ever had two electric cars to have their batteries charged. In the end we all had a great three days and I found an interesting subject to blog about. This was great news for the tyre industry. But also great news for road safety. So at last the motorists have taken notice of the tyre experts and friends. Many garages and tyre dealers are beginning to increase stocks of snow tyres. But stocks are very low so telephone or go online to see what you can find. Remember this is only the beginning of winter and so snow or winter tyres will be a good investment. Garages and tyre retailers began to see the motorists complimenting them. On how good these type of tyres really were in snow. Many garages and tyre dealers have some stocks of snow tyres. Hence, stocks are very low so telephone or go online to see what you can find. Motorists from all over the country. Were bestowing the advantages of changing to winter tyres. From summer tyres for the winter months. Prices in the last few weeks have doubled. Indeed put the price out of reach for many motorists. Especially with smaller cars, silly when safety is at stake, perhaps next winter people should start buying their tyres at the end of summer. Thus, when prices are not much different to summer tyres. It looks like the penny may have dropped as regards the drivers of SUV and Crossover vehicles. Indeed many SUV owners are also thinking about a set of spare wheels with snow tyres fitted. This seems to me to make the most common sense thing to do. Of course, you could go to a breakers yard for a set or pair of used wheels to keep the cost down. SUV drivers really suffered in the harsh snowy winters of a couple of years ago. We noticed that the BMW drivers were all over the road. Skidding on their summer tyres. I think that some of these drivers thought that they were invincible in bad weather. As a result they were far from safe? The large diameter wheels on this type of vehicle meant that in bad weather then they lost control very easily. Many of these SUV drivers did eventually fit or buy a set of spare steel wheels. This is the most effective way for using winter tyres and you would probably make a set last three winters or more. So, by changing them from your summer tyres from say November to March. Some tyre dealers have started storing customers winter tyres or wheels over the Summer months. Known as “tyre hotels” some for a small fee others may do it for free. Therefore, it may be worth asking, especially for those living in flats or drivers without a garage. As mentioned before I have had many customers telephoning me. Thanking me for the advice I have given them about fitting snow tyres. One lady customer was so pleased that she came back and wanted a set fitting to her mothers car she was so impressed. The sting in the tail is that suppliers started to inflate prices due to demand. Especially internet companies from the continent. Nokians were in great demand. They were always number one in European tyre tests and so were much sought after.Now of course Nokian tyres have built up a UK tyre dealer network. Pellon Tyres are the Nokian dealers for the Calder valley area of the UK. This winter 2010/ 2011 has proved to be worse than the winter before. Indeed November of that year had been breaking records for the coldest and the amount of snow fall. Indeed in South Yorkshire the snow reached depths of two feet in some areas. Of course, stranding many motorists, the only people who could move had either 4×4 s or were fitted with winter tyres. 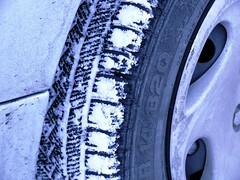 Garages and auto centres have noticed a massive increase in All-weather tyre sales this winter. However some motorists took the advice of some experts, who commented that, “motorists are becoming much more safety conscious” and “have bought new snow tyres this winter for the first time”. In fact there has been a rapid growth in the number of tyre companies. Hence, that are developing the all-weather tyres. Most notably Michelin tyres brought out the excellent CrossClimate tyres. This is a bit of an anomaly. because it is a summer tyre with winter tyre capabilities. This tyre carries the three peaks snow tyre sidewall emblem. These Michelin CrossClimate have proved to be a great success. In fact many motorists are beginning to discover the great advantage of snow and winter tyres in bad weather situations. Garages and tyre dealer began to see the motorists complimenting them. of course, on how good these type of tyres really were in snow. Nokian Tyres Inc. is once again expanding its lineup of all-season tires designed specifically for the North American market. The eNtyre C/S targets the growing CUV and SUV tire segment. Range Rover Sport and Some Other Nice Cars for the MOT TEST. I love taking some pictures and writing small articles.Especailly, about the cars that we have had presented to us. Hence, for different work to be carried out. So, it also pleases me that our customers trust us to look after their cars.Naturally, whilst they are in our care. Subsequently, this week for instance we have had a really diverse mix of cars. From an Aston Martin to a Reliant Robin that came in for a new battery fitting. Another smart looking car was a very nice Range Rover Sport, a 2007 model. Turning up for an MOT test and a service. I must admit that I didn’t like these cars a first. Of course, some of the later models are excellent cars. This particular car had a problem with a diesel leak. Which we found out to be a leak coming through one of the near side injectors. Ryan Linton my chief mechanic fixed the car by fitting a new injector seal, this was an option that we had rather than fit a complete injector this also saved the customer a few pounds in repair fees. The Range rover had a set of 22 inch tyres and wheels fitted, and the tyres were wearing away at the edges, but Ryan issued an advisory notice for this and did not fail the car. After the car was serviced and washed the car was collected by another happy customer. I must admit that I prefer the old BLMC Minis to the new BMW Minis but some of the colour schemes on the BMW Minis are just special. The car that we had in for an MOT test was in my favourite colour red. The car was really eye catching and I could not resist taking a picture. The Mini was the next test after the Range Rover and failed the test on the brake tester. The customer gave us permission to do the brake work and after removing the wheels we found that the car required discs and pads at the front and pads to the rear. We are a Unipart Car Care Centre and so we fitted genuine Unipart discs and pads. Ryan finished the job and the BMW Mini went on its way with another very happy customer. https://www.pellonautocentre.com/wp-content/uploads/2015/06/Logo_PellonCleanTrans.png 0 0 Eric https://www.pellonautocentre.com/wp-content/uploads/2015/06/Logo_PellonCleanTrans.png Eric2017-10-25 18:59:112017-11-02 10:51:16Range Rover Sport and Some Other Nice Cars for the MOT TEST. Yokohama car Tyres are probably one of the most forward thinking tyre companies in the World. One of the ways that the company will show of its prowess will be to exhibit through a stand at the Tokyo Motor Show. The company will demonstrate to car drivers. On how it strives to create a better tyre grip. So, on all its tyre products and all its tyre categories. Yokohama Japan have also been striving and succeeding in the development of lighter fuel efficient tyres. Subsequently, by the use of new compounds combined with new materials. Such as the addition of “orange oil”. Yes orange oil! Yokohama car Tyres has been using this as an alternative to petroleum based oils for over 20 years. The first Yokohama UK tyres to use this were in a compound used for racing car tyre slicks (these are tyres that have no tread, for use on dry race circuits to give more grip and for a softer compound), the orange oil helps the tyre to become sticky when they get heated up to give more traction. Yokohama car Tyres is also developing a new tyre that will grip on ice, without the help of studs, very useful in the very cold countries that normally have to rely on studded tyres. The booth will be well worth visiting and will include a concept car that is an electric car, to show off some of the new technologies, including its own super light tyres known as “fin tyres” that reduce air drag and help control the cars air drag by reducing it.